Edit: Now the problem is strictly with the portfolio section, on older mobile browsers (Mobile Safari < 8.0, Android Browser < 5.0). Have tried many solutions found in searches for this apparently common problem, but nothing so far has worked. I’ve been testing with emulators at CrossBrowserTesting via Codepen and my free trial at BrowserStack. 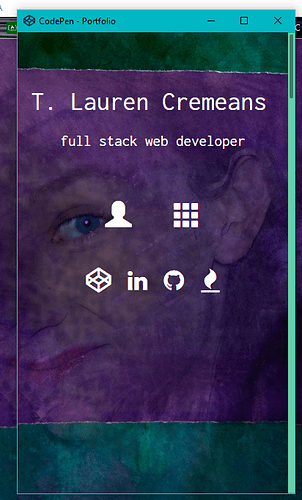 Don’t know how buggy these are, because I’m seeing inconsistent results for many elements on my portfolio page. On iPhones and iPads, seems to be a fact that background image for page body is distorted, does not cover and scrolls indefinitely. Sort of. There is really, truly always something. Thank you for letting me know.